Saturday last witnessed one of the largest crowds ever assembled within our city, the occasion being the laying of the corner stone of the new Methodist Church which is now in process of erection at the corner of College and Carlisle Streets. Bigham Lodge of this city, reinforced by brethern [sic] from Sturgis, and other lodges in the county put in a very large representation, and the ceremonies were conducted throughout with precision and great solemnity. An added feature of importance in the procession was the inclusion of the ladies of the Eastern Star Chapter which lent a distinct attraction to the occasion as did also the large and representative body of influential citizens, both public and private which participated in the march. Promptly at three o'clock the procession filed out from the Masonic Temple under the direction of Grand Marshal W. D. Cannan, and his most efficient Deputy Chastain W. Haynes, the latter of whom was mounted on a dapper gray charger. Dr. F. W. Nunn led as Grand Tiler, with his sword drawn, being immediately followed by the Brethern [sic] of Sturgis Lodge as a guard of honor. Then came Grand Secretary, J. 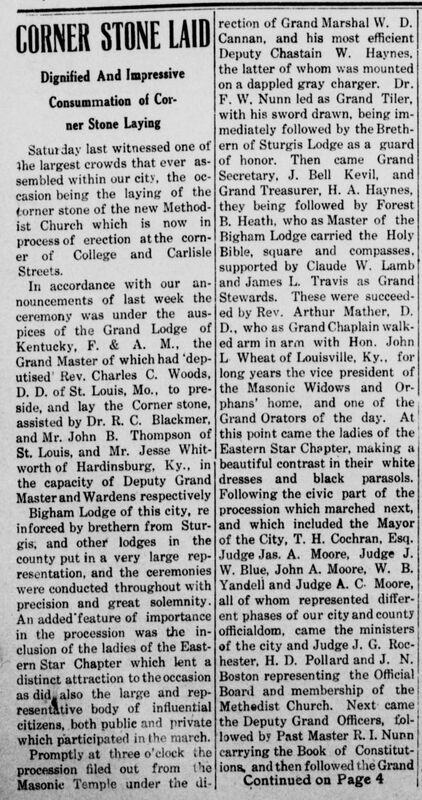 Bell Kevil, and Grand Treasurer, H. A. Haynes, they being followed by Forest B. Heath, who as Master of the Bigham Lodge carried the Holy Bible, square and compasses, supported by Claude W. Lamb and James L. Travis as Grand Stewards. These were succeeded by Rev. Arthur Mather, D. D., who as Grand Chaplain walked arm in arm with Hon. John L. Wheat of Louisville, Ky., for long years the vice president of the Masonic Widows and Orphans' home, and one of the Grand Orators of the day. At this point came the ladies of the Eastern Star Chapter, making a beautiful contrast in their white dresses and black parasols. Following the civic part of the procession which marched next, and which included the Mayor of the City, T. H. Cochran, Esq., Judge Jas. A. Moore, Judge J. W. Blue, John A. Moore, W. B. Yandell and Judge A. C. Moore, all of whom represented different phases of our city and county officialdom, came the ministers of the city and Judge J. G. Rochester, H. D. Pollard and J. N. Boston representing the Official Board and membership of the Methodist Church. Next came the Deputy Grand Officers, followed by Past Master R. I. Nunn carrying the Book of Constitutions, and then followed the Grand Master, Dr. Woods, supported by Grand Deacons T. A. Frazier [sic] and George M. Crider, C. E. Weldon acted as Grand Pursuivant, and C. S. Nunn brought up the rear as Grand Sword Bearer, making an appropriate figure as such with his drawn sword gleaming in the sunlight. The procession proceeded along Main street to Depot street then east to College, then north to the New Church site, where it openen [sic] in order to receive the Grand Master, and his assistants. As the Grand Master arrived at the platform, a reception committee, consisting of J. H. Orme, T. J. Yandell, S. M. Jenkins, and Ernest Carnahan, representing the City of Marion received them and in appropriate language welcomed them to the city. Silence having been requested Dr. Arthur Mather, as Host of the Occasion said "Most Worshipful Grand Master, Deputy Grand Master, and Grand Wardens of this Grand Lodge assembled: It now becomes my privilege to present to each of you aprons with which to clothe yourselves, the better to enable you to perform that labor which is expected from you at this hour. I hope that you will wear them with pleasure to yourselves today, and hereafter keep them as a memorial that you have this day well and truly laid the corner stone of this stately building now to be erected for the worship of Almighty God and His Son, Jesus Christ Our Lord." The Grand Master after mak[ing] suitable acknowledgement for himself and his officers, proceeded with the ceremony and laid the stone in due and ancient form, under the most impressive silence; Perhaps the most imposing feature of the whole ceremony was when the Grand Master called for Dr. Mather, as Grand Chaplain to introduce to him Sister Jane Walker, who as one of the oldest members of the Methodist Church took her place by the side of the stone, along with Brother H. A. Haynes, Dr. Mather, and little Thos. Cochran, Jr., and Clara Margaret Orme and placed their hands on it while several of the Grand Officers formed an arch of steel Swords over their hands. The Grand Master then solemnly invoked the blessing of the Almighty upon the enterprise in a most impressive manner. Another interesting item was the depositing in the corner stone of the articles which are usually placed in such receptacles, and which, in this instance, included a copy of the Bible, the Hymnal of the Methodist Church the Book of discipline, the Church and local newspapers of the day, and a silver certificate of the current year's issue, together with a record of the Church in its official and membership details, also an account of the enterprise that day inaugurated. 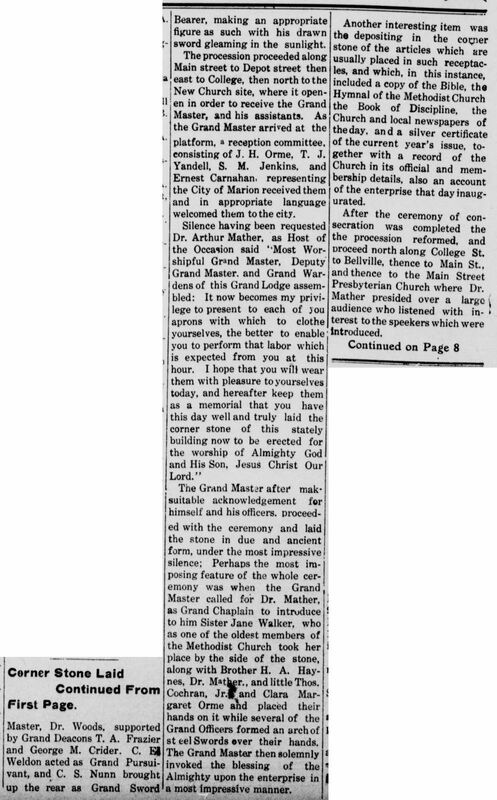 After the ceremony of consecration was completed the the [sic] procession reformed, and proceed[ed] north along College St. to Bellville, thence to Main St., and thence to the Main Street Presbyterian Church where Dr. Mather presided over a large audience who listened with interest to the speekers [sic] which were introduced. In opening the exercises Dr. Mather read letters and telegrams of greetings from Rev. Dr. F. M. Themas, Presiding Elder of the Louisville District, and Hon. Moses D. Williams, of Dallas, Texas, and then, in a few brief but appropriate sentences introduced Hon. John L. Wheat, of Louisville, Ky., who brought a gracious message of greeting from the laity of the Louisville Conference. Bro. Wheat referred in his speech to the remarkable growth of the city of Marion, from 102 people in 1870, to the present vigorous city. He also made mention of the growth of the Methodist church in the same period and give [sic] warm words of approval to the new enterprise which has just been taken in hand. Miss Anna Haynes then sang very effectively, and this was followed by a deeply interesting speech of greeting from Mr. John B. Thompson, of St. Louis, who referred to Dr. Mather's work in that city, and to the readiness of the Masonic fraternity to respond to his call for service in behalf of the extension of the Master's Kingdom upon earth. Hearty greetings were also brought from Hardinsburg, Ky., by Jesse Whitworth, Esq., who wished the Methodist people every success in their present endeavor, and who paid a splendid tribute to our loved Congressman Ollie M. James, concluding by saying that the people of Breckinridge county thought so much of our Congressman that they would roll up a majority of at least a thousand for him in his Senatorial race. Dr. R. C. Blackmer, of St. Louis, now followed with special greetings, fraternal and Masonic, and made an interesting address which was greatly appreciated. These were immediately responded to by Virgil Y. Moore, on behalf of the membership of Marion Methodist Church, who covered himself with glory by delivering one of the best speeches of the day. Miss Ada Mosshunt, of St. Louis, next sang "Calvary" in splendid style, her deep, rich, contralto voice being heard to great advantage. The splendid exercises were brought to a close with an address of great resourcefulness from Rev. Dr. C. C. Woods, Associate Editor of the St. Louis Christian Advocate, who, realizing the lateness of the hour and the almost unbearable temperature, led off in a humerous [sic] vein and in his own inimitable way spoke with wonderful effect. The Benediction, pronounced by Dr. Mather brought a memorable occasion to a close. Source: Crittenden Record-Press. (Marion, Ky.) 1909-1919, June 29, 1911, Images 1,4,8 - Chronicling America - The Library of Congress.